"Americanism NOT Globalism" will be our credo! Faux Cherokee Liz Warren must be exposed! I got an email from Congressman Greg Walden (R) saying, "I want to hear from you". No, you don't want to hear from me. I'm not buying your good cop routine. Well? Has anything changed? I don't see it. Another election and the media is still picking our candidates and NO ONE, and I mean NO ONE except Donald Trump will take them on. The RNC? LMAO! Right….The NRCC is too busy selling Trump gear to finance their RINOS who are against TRUMP! And WHO runs the NRCC…why…it's YOU, GREG WALDEN!!! Some of us have this figured out! 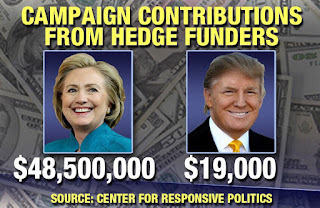 These elections have NOTHING to do with anything but BIG MONEY for the unelected operatives who have always controlled our elections, who finance your candidates. They throw us an Obama vs. McCain…or Romney. Just like they wanted to throw us a Clinton vs. Bush this time. It fits their good cop/bad cop routine so well. And they win NO matter WHO wins. THEY? Who exactly is….. THEY? The media, of course. Just about all of them. But mostly it's the people who run this government and their paid mouthpiece, legislative writing LOBBYISTS who profit from elections and are owned by the Kochs, Zuckerbergs, all the big $$$ donors who care NOTHING about ANY of us. THEY actually believed for a while that Trump would become one of them…. 'SEE THE LIGHT', as they say and get on board and play by THEIR RULES. But they can't fit Trump into their 'good cop, bad cop' routine. He won't play. THEY don't own Donald Trump. Americans, will you play this game again? Will you actually let THEM convince you with LIES to put this perjured criminal Clinton back in the White House to share the same desk/chair her impeached husband used when he serviced a young White House aid? Do you even see how you, no matter which SIDE of the isle you fall into, keep falling for their little scheme? When this country ceases to exist and your kids, grandkids ask you what you did to STOP IT…you can tell them you voted for Hillary Clinton. I hope they despise you as much as I do! I don't hate you for being ignorant. I hate your arrogance for voting when you are uninformed! THIS is more important than YOU and what YOU feel! There will never be another USA. NEVER! This is the worlds last chance. 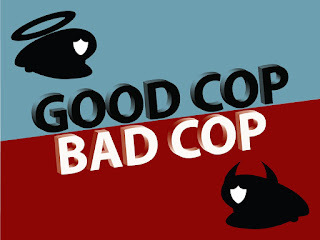 If our sovereignty isn't protected, we have NO PROTECTION from the "good or the bad cop" ! And it's ALL about immigration and trade! It is Americanism vs. Globalism. 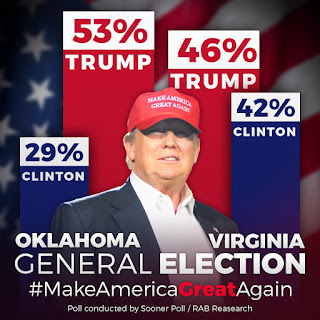 And Trump is the ONLY candidate who isn't on the Globalism bandwagon. Wake up! Stop believing the media! Get off your lazy asses and LEARN some facts…listen to a Trump rally….NEVER has Trump or his supporters started violence at his rallies! NEVER…that is a media creation! WAKE UP! Stop being part of the problem and falling for their scams! You are being used while you defend the people who use you. That is a sick codependency. 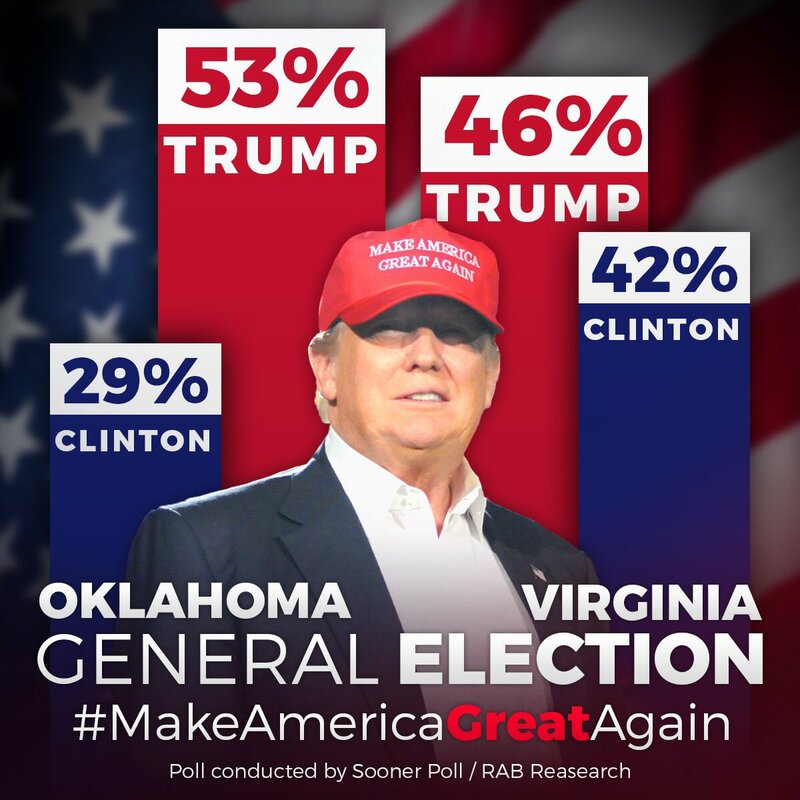 Donald Trump and Hillary Clinton are NOT the people the media is convincing you they are! Meg Whitman says she'll vote for Hillary. There's your proof (along with Ryan, McCain, all the RINO's who tell you just enough to get your vote!) that she just played the 'good cop' for a time. TTC TOLD you for years this woman is NOT a conservative! She's an open border sell out! Always has been. When she praised Van Jones and McCain, you should have figured THAT out! 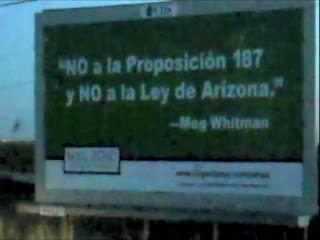 Photo Translation: "No on Prop 187 and No on the Law in Arizona." An actual Meg Whitman for Governor Campaign sign. USE your brain for something other than soaking up propaganda! Hillary says she's going to CHANGE things to give you what you want, then tells you she's going to keep Obama's and Bill's policies….. HELLO! WHY are there thousands more at Trump rallies than at Hillary rallies? WHY has it been near a year since Clinton gave a press conference? 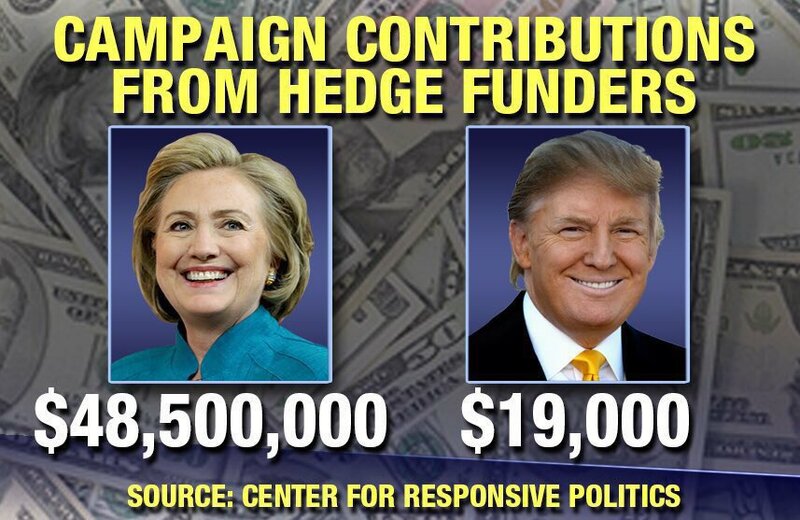 Trump takes them all on…and yes sometimes he's not the POLISHED mouthpiece that lawyer Hillary is…THANK GOD! AND This is ALL you need to know about the CON man Khan, gold star daddy and Immigration lawyer making a FORTUNE using the Fraudulent E5 RICH alien visa program to fill us to the GILLS with Muslim/Sharia loving aliens! 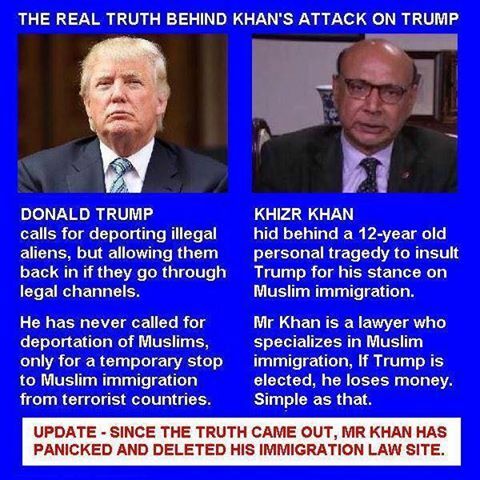 THIS IS ALL ABOUT immigration.....Trump is right and the big $$$ in immigration wants him gone! Keep in mind that making the E5 BIG $$$ immigrant visas permanent is RYAN’s objective in the house. This is ALL about $$$$! Ryan is OWNED by another immigration lawyer, Cesar Conda, who along with Grover Norquist/Rove got E5’s put into Bush’s immigration policies. Some (Sen. Grassley) are trying to reform the E5 because it is a FRAUD magnet. Others like Ryan, Flake, McCain want it left as is....CORRUPT. "Good cop/bad cop" routine, also called joint questioning or friend and foe, is a psychological tactic used in negotiation and interrogation. "Good cop/bad cop" tactics involve a team of two interrogators who take apparently opposing approaches to the subject. Obama is turning lose hundreds of felons from prison...some life sentences.....he sure loves criminals! Vote democrat...the party that LOVES criminals!